The handsome chair, No. 6881, designed by Irwin Seating and often found in theaters, was upholstered in figured velour. An aisle-light, shown here in blue, was a standard feature according to the description below the illustration. A noiseless ball and socket hinge allowed the seat to be raised and lowered. Several color combinations and designs were available. Further information about the chair and its specifications are listed below the illustration. Chair No. 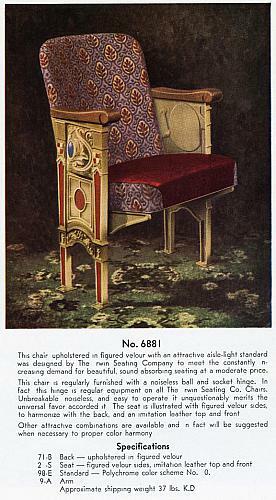 6881 was featured on page 28 of Irwin Seating Co. Catalog #32. Trade catalogs provide wholesale customers with important information about the company's available products.